Coaching is becoming a profession within the legal profession. Learning to become a business development coach or to refine your coaching skills to help lawyers reach their full potential for developing business is a great career opportunity. Through LSSO’s partnership with LawVision, we bring our attendees and members unparalleled opportunity for advancing their careers as business development coaches. Further, our coaching certification will provide you with the training, tools, and credentials to coach lawyers at all skill levels. Understand how firms are allocating their marketing and business development budgets to support growth. As a legal marketing professional, you understand the increased pressure to initiate, cultivate and secure relationships that make an impact on your firm's bottom line. That's why Bloomberg Law and the Legal Marketing Association have partnered to bring you research to provide critical benchmarking on priorities, staffing and objectives. Download the newly-released 2017 report, “Aligning Legal Marketing and Business Development Resources for Law Firm Growth,” now to discover how and where law firms are investing in order to retain clients and find new business. More respondents (66 percent) predicted that firms would increase spending on marketing technology over the next two years than any other area, including content marketing (54 percent) and paid advertising (50 percent). Firms of all sizes employ on average one marketing or business development professional for every 25 attorneys. Respondents at mid-sized firms of 100-299 lawyers were the least confident that their firm’s marketing budget would increase over the next 12 months (23 percent thought it would), while respondents at small firms were most confident (44 percent). Action vs. Beliefs – Marketing & BD professionals report that developing greater knowledge & expertise in the client’s business and investing in client experience are the two greatest areas of perceived differentiation yet, investing in these areas does not receive the same budgetary focus. 28% of respondents indicated a desire for greater involvement in strategic planning. Download the complete survey findings now. Come discuss the future of legal services with clients in the market like Aon, TIER REIT, BBA Aviation, and Heritage Health Solutions. Then, put your sales skills to work and visit with some of the 10,000+ corporate headquarters in Dallas/Fort Worth on Thursday and Friday. Do you want to stay ahead of the curve when it comes to firm growth? One of the most difficult challenges facing firms today is finding the insights and tools to help them find growth in a competitive and challenging market. This session will highlight the fundamental elements of finding growth in a flat market. Discussions will revolve around determining the future of the market, leveraging tools and processes for cross-selling and measuring successes, and finding, in the end, your puck to score the big goal. There are a limited number of spots for this in house professionals-only workshop. Registration is required. David Wheeler, the General Counsel of BBA Aviation’s aftermarket services group, which provides aviation ground services, including repair and overhaul of jet engines and aircraft cleaning and maintenance work. Staying up to date on trends and competition can be overwhelming. LSSO's monthly updates and the annual RainDance conference are here to help. This month's Spotlight Article provides key findings and benchmarking data from Bloomberg Law's recent marketing survey. There is still time to register for this year’s RainDance Conference in Dallas on May 9-10. You'll hear from your peers and industry leaders on finding growth in a flat market, creating compelling service experiences, using the voice of the client, delivering great sales presentations, right-pricing, the present and future of legal technology, and what GC-clients love and abhor about legal service and marketing. Please join and support our partners and sponsors this year, including Bloomberg Law, Thomson Reuters, LexisNexis, Practice Pipeline, gwabbit, Experience Management by Intapp, LawVision, LMA, Prosperoware, Rothschild Marketing and ContactEase. As always, feel free to send us any other suggestions, comments or contributions to our newsletter by contacting Kirsten Lovett at KLovett@LegalSales.org or to John Cunningham at C3Cunningham@gmail.com. Firms that tend to win in competitive bid situations have that special something that separates them from the pack. Something that gives them the edge when the playing field is seemingly level. It’s elusive – even a bit mysterious. However, clients know it when they see it and will pay more to have it. The firm that finds it is the one that wins – time and time again. Rick and his team have studied hundreds of pursuits – both wins and losses – to help firms better understand what it takes to win from the perspective of their clients and prospects. This highly-engaging and interactive presentation will have you tweaking your next pursuit strategy. Technology, innovation and the changing market for legal services is impacting how law firms acquire and retain clients and how law firms remain profitable and competitive. Professor Gabriel Teninbaum will explore the legal innovation landscape and changes on the way. Hear how large and small law firms are incorporating technology, responding to client demands and feedback, and how AI and other technologies and trends continue to impact the competitive legal landscape. recognize both individuals and teams that played a significant role in helping their firms drive revenue through a specific sales or service initiative in the past year. Winners will receive a 1-year membership to LSSO, bragging rights and an elegant glass trophy to be displayed at your firm. 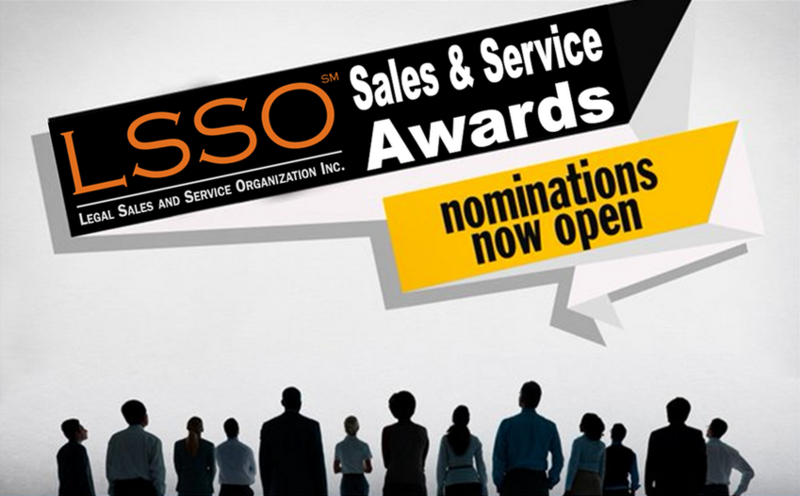 Sales & Service Awards winners will be announced at LSSO's 14th Annual RainDance Conference on May 9 & 10, 2017 in Dallas. Our panel of esteemed judges are looking forward to receiving your nominations. 4 Weeks Until RainDance - Are you Registered? Learn what's working (and what's not) at our industry's foremost peer-to-peer conference exclusively focused on legal sales, service excellence and process improvement. LSSO has a limited number of rooms at the Magnolia Hotel at a reduced rate of $179/night. It is 3 blocks from the Tower Club. Please click here to book your reservation. The Legal Sales and Service Organization is bringing back its rapid-fire GC panel event at this year’s RainDance™ Conference on May 9-10 in Dallas, TX. This year’s GC panel program will feature some new and timely topics in addition to the traditional areas of inquiry into what law firms are doing well and not so well. Have you ever wondered how your law firm’s marketing and business development (BD) strategy benchmarks against other firms like yours? Participate in the 2017 Marketing & Business Development Survey from LexisNexis® InterAction® and LSSO to discover the answers. You’ll also have the opportunity to win one of three gift cards. Join us at RainDance to hear the survey results. LMA Members - contact me for the LSSO member discount code to register for RainDance 2017. RainDance is May 9 & 10, 2017 in Dallas, TX. Find more information here. Contact Kirsten Lovett at klovett@legalsales.org for your discount code.